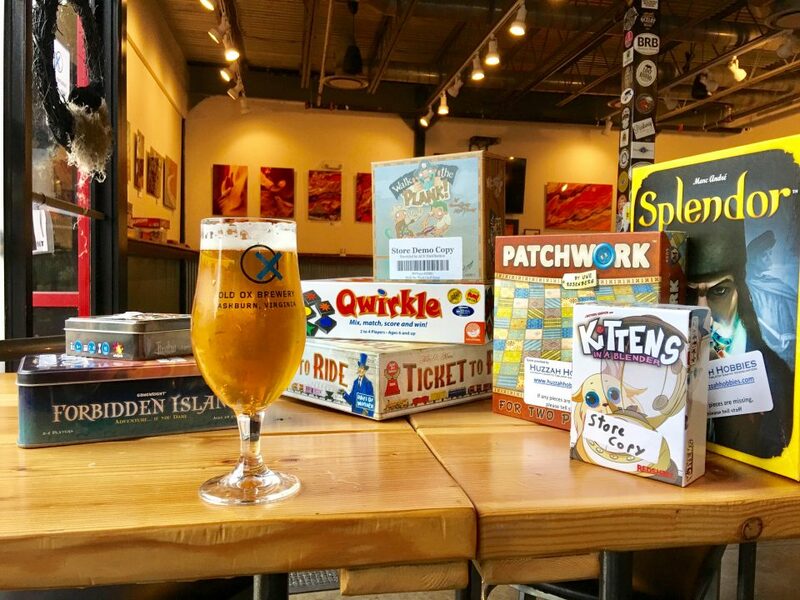 OOB is partnering with Loudoun County’s game experts Huzzah Hobbies to bring you Game Night at the Brewery! Come enjoy a beer and play your favorite games or try a new one. No experience needed – the Game Masters from Huzzah Hobbies will help you learn and play along! Sushi Go: A 20-minute card game everyone can play. In Sushi Go!, you are eating at a sushi restaurant and trying to grab the best combination of sushi dishes as they whiz by. Score points for collecting the most sushi rolls or making a full set of sashimi. Dip your favorite nigiri in wasabi to triple its value! And once you’ve eaten it all, finish your meal with all the pudding you’ve got! Splendor: In Splendor, you are a Renaissance merchant. Using tokens representing gemstones, you will acquire developments which produce new gems (bonuses). These bonuses reduce the cost of your purchases and attract noble patrons. Each turn is quick: one, and only one, action! The first player to reach fifteen prestige points by accumulating nobles and development triggers the end of the game. Qwirkle: Mix, match, score and win! Players score points by building rows and columns of brightly-colored tiles that are either all the same color or all the same shape, without creating duplicates. Look for opportunities to score big by placing a tile that touches multiple pieces with matching attributes; create a line of all six in a row, and you score a “Qwirkle”. The player with the most points when the tiles run out wins! A combination of Scrabble and Dominos…beware…this game can be addictive! Kittens in a Blender: This fast-paced card game has players working to save all of their own kittens before the unthinkable happens. But sometimes the only way to save your precious litter of kittens is to let those curious little cats learn the lesson of why you should never play in a Blender! King of Tokyo: Mutant monsters, gigantic robots, and strange aliens are destroying Tokyo and whacking each other in order to become the one and only King of Tokyo. In order to win the game, you must either destroy Tokyo by accumulating 20 victory points or be the only surviving monster once the fighting has ended. Intrigued? Get your game on and join us for fun and games!